Dr. Bruce Robinson, Dermatologist in New York City recommends SculpSure body contouring for the permanent removal stubborn fat. SculpSure is ideal for people with areas of fat, particularly those spots that seem resistant to diet and exercise. Dr. Robinson and his team can recommend a customized treatment plan for your goals. Contact Cooling Teacnology keeps the skin comfortable during the treatment. Side effects are mild and temperary in nature, with the most common being tenderness. The feathering of heat provides a natural - looking result. Clinical studies have shown 83% to 100% patient satisfaction rate. Every patient is different. Most patients see the best results when they have a series of treatments. There is no recovery period or downtime with SculpSure, so you can have the treatment and spin, swim or get right back to the gym immediately. Patients may start to see results as early as 6 weeks following treatment as the body begins to gradually lose the targeted fat cells, with optimal results usually seen at 12 weeks. The number of fat cells in our bodies typically remain constant throughout our adult life. 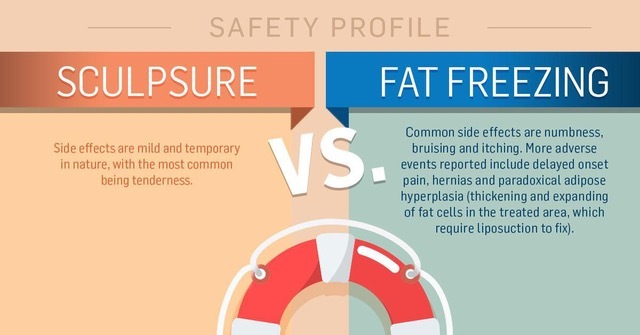 After the SculpSure treatment, the destroyed of fat cells will never return. However, as we lose weight, the size of the fat cells beome smaller, but typically do not decrease in number. Even with diet and excercise, many people have difficulty losing weight in these trouble areas.